Synopsis: Brian O’Conner and childhood friend Roman Pearce are re-united by the FBI to bring down a Miami drug exporter in exchange for clear records. Surprisingly, this is one of those rare occasions where the sequel is at least equal (if not superior) to its predecessor. The plot is strictly by-the-numbers, a pick-n-mix collection of genre cliches and stereotypes: ruthless gangster, vicious (but not too bright) henchmen, crooked cop, belligerent FBI agent, bolshy sidekick, and so on. But the plot isn’t important in movies like this; people don’t watch these movies to see how the characters develop or to absorb a complex plot. They watch movies like this to see: A) Cars racing B) Cars crashing C) Men fighting D) Hot women in bikinis And in this area, 2 Fast 2 Furious delivers. In Vin Diesel’s absence – he mistakenly believed he had a future as an A-lister – Paul Walker takes centre-stage and, while he’s an engaging enough sort, he’s already (at 30) looking a little long in the tooth for a role like this. He’s too old and he’s white, but he talks like some sixteen-year-old black dude. 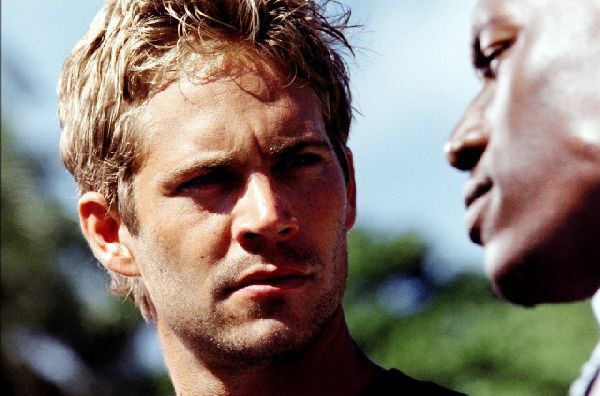 Tyrese, who fills the sidekick role, can get away with it because he is black, and those guys can talk that lingo all their life without looking stupid; but Walker, with his blond California locks and his boy-band member smile just comes off as an ageing surfer, the kind that all the young kids laugh at behind his back. The movie takes place in a world that doesn’t exist, and is populated by unreal people: gangsters, cops, racers, and hot women; it’s a teenage make-believe world in which only bad guys crash, cars perform the tightest of handbrake turns at speeds of over 100mph, and women are beautiful and wear bikinis all day long. It’s a world in which our two heroes bicker and squabble like… well, like a couple of teens. And it’s a world in which there is no room for good guys. This is a trend that we seem to see more and more in action flicks these days. The day before watching this I saw The Transporter (2002), in which the ‘hero’, played by Jason Statham, is a driver-for-hire to the underworld. Statham’s character has all the assets of the conventional hero — he’s strong, smart, resourceful, and disciplined — but he’s happy to deliver a kidnapped girl to gangsters for a fee. It seems today that the only prerequisite for being an action hero is to simply be less of a bad guy than the other bad guys. In The Transporter Statham is marked out as a ‘good’ guy simply because he gives his human cargo, who is trussed up in a bag, a drink of orange juice; in this movie, Brian O’Connor (Walker) and Roman Pearce (Tyrese) steal drug money — but they steal it from the wicked drug baron before it can fall into the hands of the police, therefore they too are good guys. It’s a baffling development that suggests either producers know their audience too well, or not well enough: too well, and they’re effectively condoning — and exploiting — the target audience lifestyle; not enough, and they’re simply insulting them. Of course, at the end of the day, the cars are the stars. They gleam and roar and hiss plumes of steam, they seem to hover above the tarmac on a purple neon glow, and overtake their more pedestrian brothers on crowded motorways in reverse gear. The opening race is an exhilarating blast of fast cutting and — in a cynical attempt to reinforce in its audience’s mind the similarities between driving these machines for real and through a 19″ PC screen — of telling shots of eyes and hands. The director of this film is none other than John Singleton who, after his outstanding 1991 debut, Boyz n the Hood, can be forgiven for wondering just what the hell happened to that brilliant career everyone was anticipating. Still, you can’t help feeling that it’s because of his firm hand on the wheel that 2 Fast 2 Furious is better than most movies of this type (especially sequels). But, of course, the wonderful thing for makers of this kind of movie is that it’s aimed at a fairly specific age-group — males aged around 14-18 years — and, as every woman knows, no male ever really outgrows this stage of their development. Fast cars and hot babes: they’ll add a couple of stars to any rating every time.